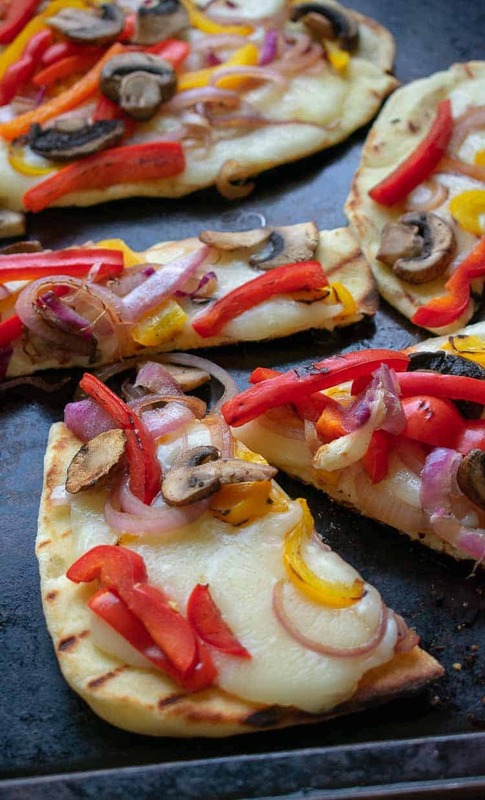 Grilled flatbread pizza recipe that’s a tasty summertime treat. 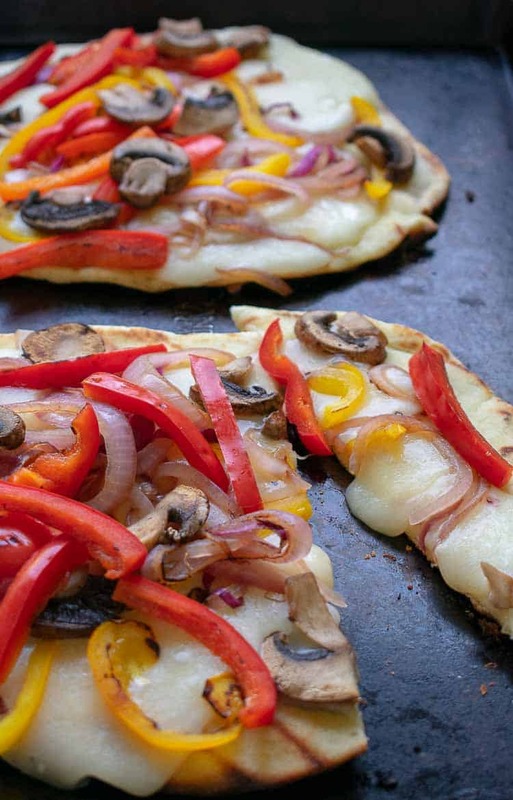 Easy to make with naan bread, toppings and creamy fresh mozzarella cheese. Are you craving pizza but are reluctant to start your oven in the heat of summer? Me too. 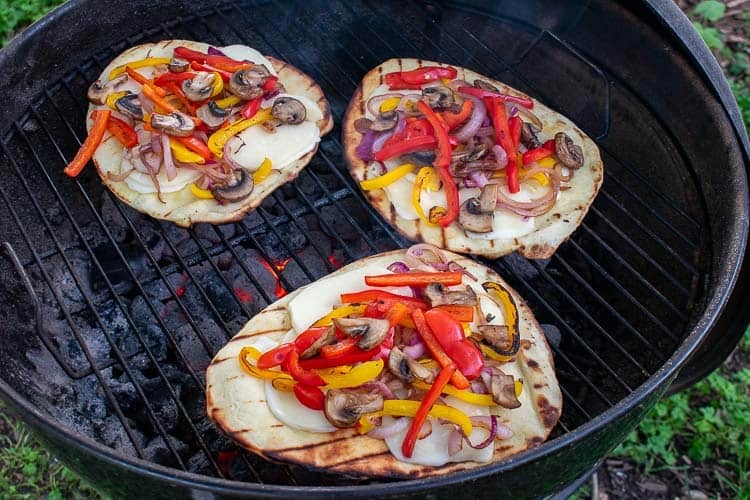 How about starting your grill and grilling a flatbread pizza right on the grates? This is so simple. And to make it simpler, use store bought naan bread for the crust. Most grocery stores, if they are hip enough, will have naan bread….usually in the refrigerated section. If you can’t find it in your store, try a co-op or a whole foods store. If you do some prior planning, you can easily make your own naan a day ahead and save some money. Here’s a recipe for naan bread from JoCooks website. I’ve been grilling food for dinner quite a bit this summer and a couple of times it resulted in a blog post. Like….Grilled Shrimp Kabobs with Orange Glaze and Simple Chicken Brine for Grilling. I use a Weber kettle grill with charcoal briquettes started in a chimney. A gas grill will work just as well set on low flame. You don’t need a hot grill to make these. 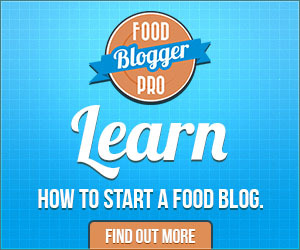 Once the briquettes turn white, pour them out in an even layer on the bottom of the grill. 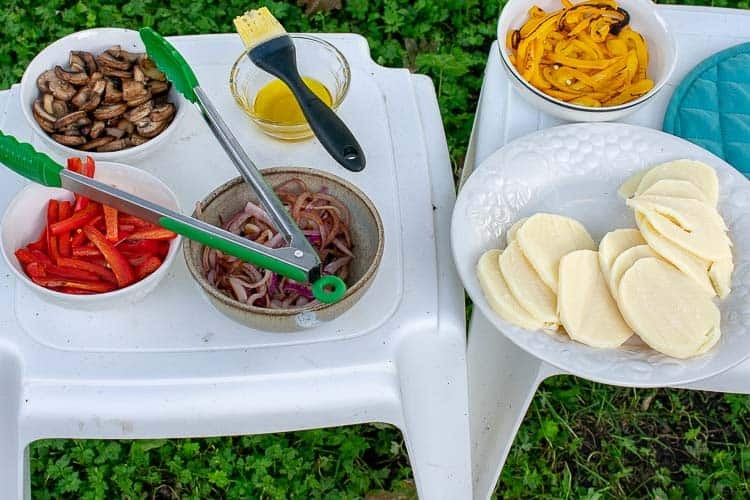 This is when you could start grilling the toppings for the pizza if desired. I actually used a stovetop and a dry, cast iron skillet to pre-cook the veggies I put on the pizzas. 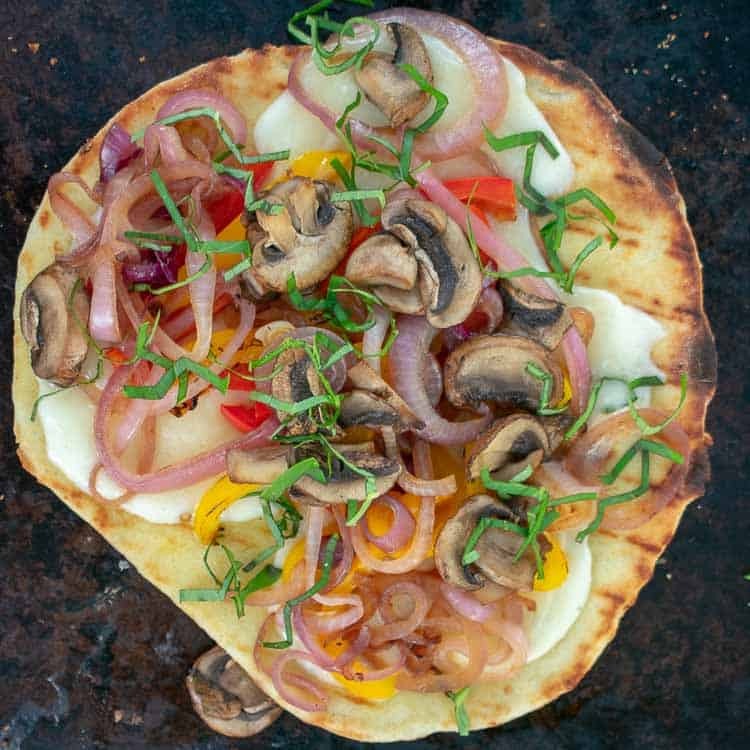 Either way, your toppings will generally need to be pre-cooked for these fast grilled flatbread pizzas. The choice of toppings is up to you, but I would recommend using fresh, sliced mozzarella if you’re using cheese. It melts quickly and tastes so darn good. The toppings used are up to you and when making pizza, anything goes. Here are some of the most popular: Pepperoni…Mushrooms…Italian Sausage…Onion…Bacon…Extra Cheese…Peppers…Black Olives…Spinach…Fresh Basil…Ham…Sliced Tomatoes. And I don’t know who thought to put pineapple on a pizza, but it is just wrong. Pineapple is for upside down cake and whipped cream. Never for pizza. (Cue the comments). So after you have grilled the veggies, maybe 30 minutes has elapsed, the coals are cool enough to start your pizzas. Check the temperature by placing your hand over the grill. If you can keep it there for 4 seconds, you are good to go. Lightly brush one side of the naan with olive oil and lay it on the grate, oiled side down. You want to just char this side a little to crisp it up a bit. Turn the naan over and quickly oil it again then add your cheese then toppings. Cover the grill. Depending on the temperature, the pizzas will take only a couple minutes to cook. The cheese should start to melt and the bread will have a nice, crispy bottom. It’s best to have a helper to remove them from the grill and two pancake turners should do the trick. Now you can throw on some chopped basil or add some red pepper flakes for flavor. Serve them right away, slicing with a pizza cutter. 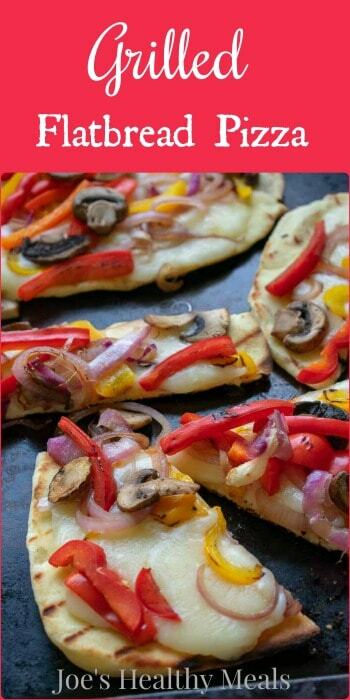 Easy to make grilled naan flatbread pizza sure to be a hit with the family. Start your charcoal or gas grill, (on low heat). Spread the charcoal evenly on the bottom of the grill. Cook the veggies and mushrooms in a grilling pan until slightly charred. Alternatively, saute the veggies on the stovetop in a dry, cast iron skillet until softened and slightly charred. Once the coals have cooled to where you can place your hand over them for 4 or 5 seconds, oil one side of the naan and place on the grill, oiled side down. After about a minute and the naan is lightly charred, turn, oil again and place the cheese on first then the toppings. Cover the grill. In 1 1/2 to 3 minutes the cheese has started to melt and the naan will have a good crispy char on the bottom. Remove from the grill with a couple pancake turners, (with some help), top with chopped basil, red pepper flakes or extra cheese if desired. Serve right away. Nutrition information is for 1 whole pizza. The toppings indicated are what I used. You can use any topping you like. When I made the pizzas the charcoal was still a little too hot. Make sure you let them cool down before you throw on the naan. Mine tasted great, but the cheese could have melted a little more. If you smell bread burning you know that they are ready to take off the grill! 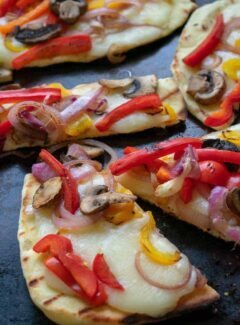 I love the light char on the crust, the melted cheese, the fresh vegetables and mushrooms; super easy and a perfect light dinner on a hot night!